Meaning: I bow down to the bow-wielding Rama, armed with incisive arrows, the subduer of all asuras, he who wards off all my difficulties. Meaning: I bow down to him whom I know as Rama, Ramabhadra, Ramachandra, Raghunaatha, Naatha (my overlord) and husband of Seetha. Sri Rama will ward off all our sufferings. To have the divine spiritual site of Lord Rama located in Ayodhya, we group of 600 members took a journey in footsteps of Lord Rama from all the parts of India. In the Day 01 of yatra, we were at Sage Valmiki Ashram located in Bithoor. Day 02 & 03 - we visited places in and around Ayodhya. Our accommodation was arranged at Birla Mandir where most of the pilgrims taking pilgrimage from Southern India stay. Birla Mandir has accommodation capacity of around 250 members only, but we were around 600. Hence we stayed in 5-6 different Satrams (boarding choultries) at Ayodhya. Even though all devotees stayed in different places, the food was cooked and served at one common place only. It is the practice of the Hindus to offer Food to God before taking food. Hence, we carried an small idol of Lord with us in the yatra. Before consuming the cooked food, the same was offered before the Lord as "Naivedyam" and then consumed as prasadam (holy offering or holy gift). In Vishnu Sahasranamam Bishmacharya, states that Lord Rama is Bhaya-nasana, the destroyer of all fear caused. When we carried out this yatra for the second time, while going to Ayodhya, it was the on the same day the announcement of Ram Janma Bhoomi verdict taking place. All the devotees were worried if we were able to go inside Ayodhya and visit the temples due to security reasons. Luckily by God's grace we were able to go and also had good darshan of Lord Rama. In the same time the crowd at Ayodhya was also quite less. This Mandir is dedicated to Sri Rama and is like any other Divyadesam in Tamilnadu. The temple structure, the Archamoorthys and the mode of worship are all as per Bhagavad Ramanuja Sampradaya Srivaishnava tradition. 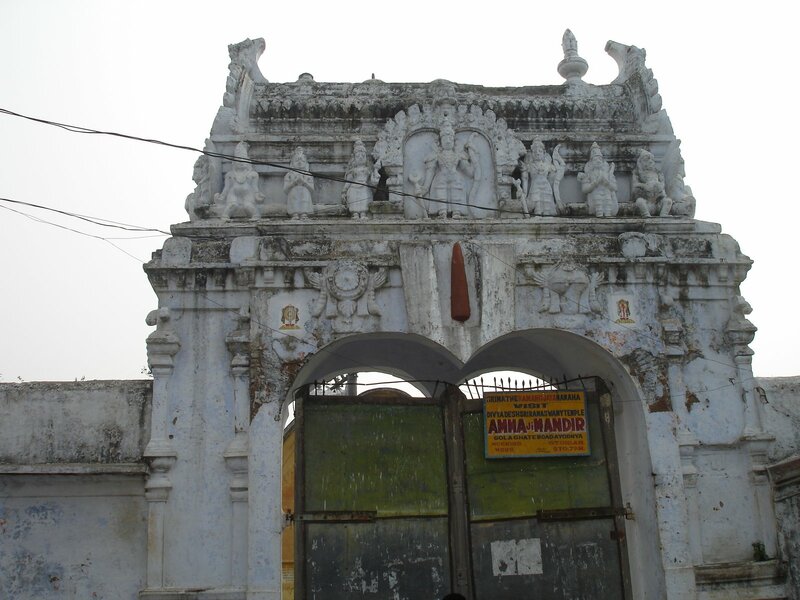 It's a South Indian style temple in Ayodhya, which is managed by the Saraswathi Bhandaram Trust. This temple is around 100 years old and located close to the banks of the river Sarayu. This temple came into existence by the efforts of a noble souls by names Yogi Parthasarathy Iyengar & Smt Singammal. The founder of this temple, Sri Yogi Parthasarathy Iyengar was known to possess in-depth knowledge in Hindu religious scriptures, theology, and traditions with versatility in Sanskrit, Tamil, Telugu and Kannada languages. He was responsible for bringing out publication of various Hindu religious texts. He was invited to participate in the World Congress of Religions held in Chicago in 1893. His thesis, the Science of Religion, was taken up for discussion at this Congress and received all round approbations. Yogi Sri Parthasarathy was a Member of the Group, which was responsible for identifying Swami Vivekananda to the whole world. There is an interesting story about the beginnings of this temple. Sri Krishna desired to build a temple for Sri Rama. There lived one Swami Parthasarathy Iyengar in Tiruvallikeni, Chennai. He was publishing many Sri Vaishnava books from Tiruvallikeni, from circa 1870 to about 1890. He was called Yogi Parthasarathy, and with a desire to worship the Lord in all Divya Deasams, he took leave of Lord Sri Parthasarathy, in Tiruvallikeni. In his tour of North India, he visited Badarikashram, Salagramam, Devaprayag, etc., and landed in Ayodhya, the Janma Bhoomi of Lord Sri Rama. He worshiped the Lord and things were going routinely. But still there was a yearning, for a temple with Southern Culture and with South Indian sculptures. His thoughts, perhaps, reached the Lord. The Lord decided to convey to his wife Yogi Singammal, that He desired to have a temple, through their efforts. On one night, when Yogi Smt. 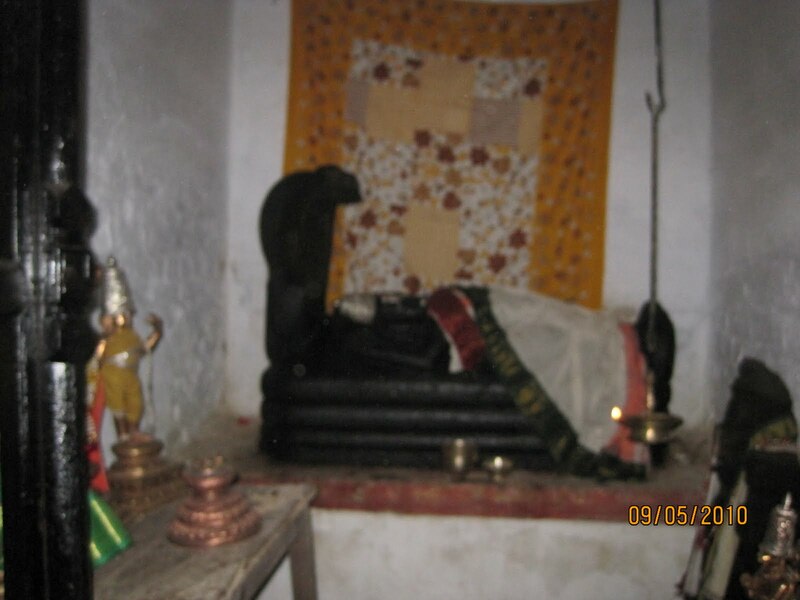 Singammal, the wife of Yogi Sri Parathasarathy, was fast asleep, in her dream she found the Uthsava Vigrahas of Sri Rama and Seetha buried in a dilapidated temple in the village known as Thiruppullani (Dharbasayanam) in Ramanathapuram District of Tamilnadu. The couple went there looking for it. Her dream turned out to be true as they found the dilapidated temple as well as the Sri moorthys. With the assistance of their friends and relatives, they met the King of Ramanathapuram and took his permission for taking these Vigrahas with them. After that, they have decided to shift to Ayodhya and build a temple for Sri Rama and install the Vigrahas in that temple. In about 1898-99, this couple visited here. Within Five years, all construction was completed; the idols were brought from Tiruppullani; and in 1904, this new temple was consecrated. From that time, till about Five years only, Yogi Parthasarathy was here. To serve the Lord permanently, he departed for Vaikuntam. But his wife, Yogi Singammal, lived thereafter, for about 30 years, in Ayodhya. From Tiruvallikeni, this couple came to Ayodhya and served the Lord Sri Rama. She looked after the administration of the temple and also taught important aspects of Sri Vaishnava philosophy, and spread Swami Ramanuja Sampradhayam. Though her original name was Singammal, she was known popularly as Ammaji and the temple also was called Ammaji Mandir. With the passing away of Yogi Sri Parthasarathy within a few years after moving into Ayodhya, his wife took up the responsibility of completing the temple and organizing Nithya Aradhanams, Uthsavams etc. Since she played a very significant role in bringing up this temple, the shrine itself is popularly known as AMMAJI MANDIR. The Moola and Uthsava moorthys are simply beautiful and a treat to watch them unendingly. As we enter Raja Gopuram, we come across Dwajasthambam. Further inside is the Maha Mantapam. Then is the Arda Mantapam. 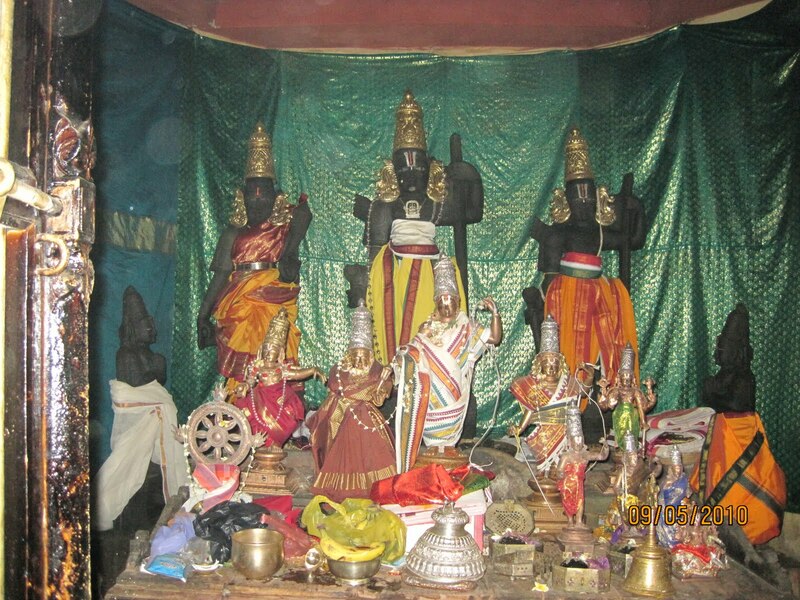 Sri Utsavar is Sri Rama standing at the center. He is holding His bow, Kodandam. On His side is Lakshmana, ever ready to serve Sri Rama. On the other side is, Sita Matha. Nearby is Sri Nartana Krishna, dancing Next is Vishvaksena, the commander. Sri Balaji of Tirumala is also gracing here. Sri Ranganatha, the Lord, Who was worshiped by Sri Rama, is also here in a separate sannidhi. In this sannidhi, there is another set of Sri Rama, Sri Sita and Lakshmana There is another sannidhi of Azhvars and Acharyas. We can see Nammalwar, Tirumangai Alwar, Swami Ramanuja, Swami Alavandar, etc. Meaning: I salute sage Valmiki - the nightingale, who sings in sweet voice the sweet name of Rama, Rama, from the 'tree' of poetry. Sage Valmiki emerged from Anthill. We depend on Goddess Earth (Bhooma Devi) for each and every activity in our daily life. It is said that the anthills are the ears of Bhooma Devi. Valmiki the name derived from Valmikam, mean Anthill in Sanskrit, because he took rebirth from an Valmikam (anthill) he is known as Valmiki. 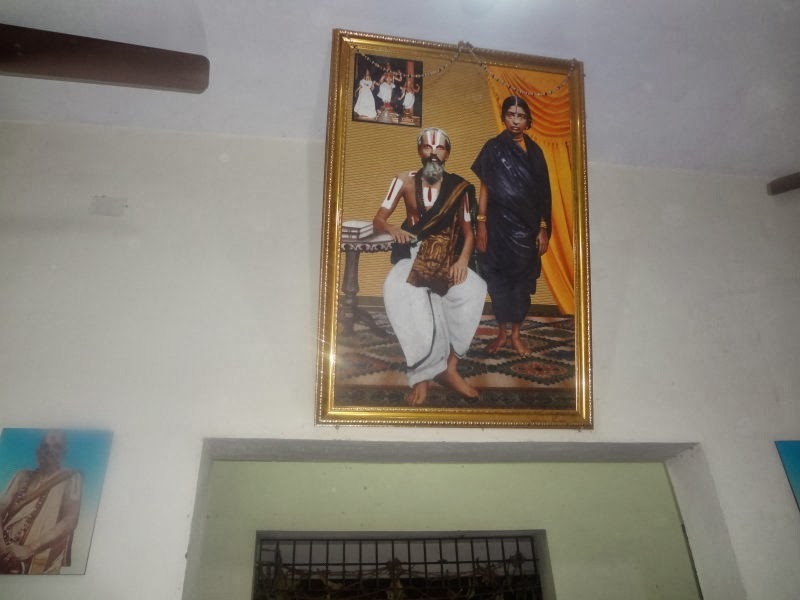 The bhavan dedicated to such an great sage is the Valmiki Bhavan located in the small street of Ayodhya. The Valmiki Bhavan is an wonderful site to see. We have to reach this place through Auto Rickshaws or Cycle Rickshaws only. Because we don't have any other means like Bus due to its location (small street). Valmiki Bhavan is an marvelous construction, built with white marbles and red stones from Rajasthan. The entrance itself speaks of the grandeur of the building. This huge structure can accommodate around 5000 people at a time. Ground floor is very large. There is an upper floor. All are built with marble stones. All 24000 slokas of epic Ramayana are inscribed on the four walls of the bhavan with pictures of the most important incidents of each kandam on the top. Like a child feeling happy in the laps of its mother, we are also happy to be in the middle of all slokas in this building. It enriches us with nice feeling and positive vibration. Many great scholars and souls have visited this place over ages. There is a large Library in this building. It contains Thousands of books and all the translations of Ramayana in every language. All visitors are allowed the take the books related to Ramayana from the Library to do parayanam (reading) and are returned back while leaving. We can have the darshan of Sage Valmiki with his grandson's lava and Kusha. Since, Sage Valmiki considered Sita Matha as his daughter. It is an charming experience to see these marble idols. Another feature is that from Himalayas to Kanyakumari, many people write 'Ram', 'Sri Rama', 'Sri Sitaram', 'Sri Jayaram', 'Sri Ramajayam', etc., and all those books and notebooks are collected here. During Kumbhamela or during Sri Ramanavami, collected books are offered to Sarayu river, by immersion. We also had an opportunity to meet sadhus, who had come to explain the glory of lord Rama. We also performed upanyasam (narrating stories from epics and puranas and interpreting scriptures) at Valmiki Bhavan. Meaning: The folks were always talking about 'Rama', 'Rama', 'Rama'; when Rama was ruling Ayodhya, the whole world became 'Rama'. During and after Rama's rule, the two syllables 'ra ma' became the life source of everyone.